sound and comfort level. If you are in search for the perfect headphones that will meet all the requirements of your home studio or even a professional set up and won’t break the bank then you have found your match. From mixing and mastering to professional podcasts and even movie voiceovers, these are the headphones for you. The Sony MDR7506 Studio Headphones recently grabbed our attention mostly because of its low price tag and the popularity throughout the producer community lately. These headphones are legendary in the industry and continue to outlast all the fads that come and go. Hearing the brand name Sony, you automatically think of quality and long time consumer service. 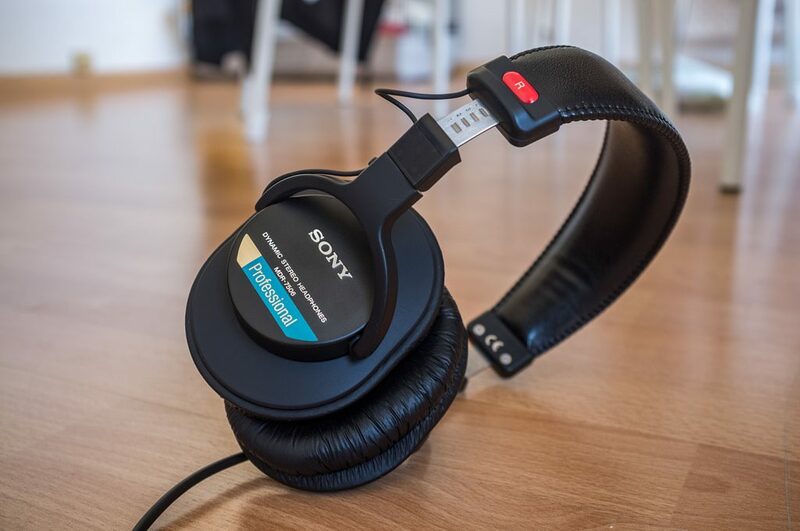 These headphones have been around for a very, very long time, have been used by thousands of professionals in every industry and not much has changed since their release because Sony likes to get it right the first time, especially when it comes to sound quality for their electronics. Hailed as one of the most versatile studio headphones ever created, everyone from radio talk show hosts to the world biggest Electronic Dance Music producers use these headphones on the road, in the studio, and even live. The Sony MDR Studio Headphones are perfect for anyone looking to get their sound quality on par with some of the best in the business without breaking the bank. •For the powerful and detailed sound quality, the MDR is equipped with the Neodymium magnets that have the 40 mm drivers that provide an amazing crisp sound on all frequencies and EQ’s. •It has the closed ear designs that will not only provide you comfort but the external noises will also be blocked at an almost nonexistent level. •It has a 9.8-foot long cord that ends with a gold plated plug for the proper conduction of sound. • A ¼ inch adapter is included with the headphones for using them on 1/8″ and 1/4″ applications. •A soft case is included to provide the headphones protection during traveling or transport. •The cord is not detachable like on most newer model headphones. But in my opinion this is just more mechanically secure, less moving parts = less breakable parts. Everyone knows this is the most important factor to consider when choosing your studio headphones. For once, the bass on a pair of headphones is not artificial, these give TRUE bass all the way around instead of simply making the lower end louder like what we think goes on with the Beats by Dre. The Sony MDR7506 Studio Headphones provide the listeners with a true balanced sound quality that doesn’t interfere with your actual mixing and mastering. However, the soundscape can sometime seem very flat like there is almost no bass if your EQ is not on point, which might not be liked by most of the music lovers. The sound of the headphones is perfectly balanced between the left and the right ears. We noticed no distortion in the sound at any realistic dB or EQ setting, nor did we notice any frequencies creeping in the back that might throw you off on your production techniques. Sometimes saving money might not provide you with the features that you desire. It might not provide you with anything exciting, however, there is a reason the legendary Sony MDR line has been the number one pick for producers through all generations: the sound quality. That is what really matters and that is what loved by all of us. So, if you are in search of quality sounding headphones for your studio without all the logo flash that some companies throw around, then the more than affordable Sony MDR7506 Studio Headphones “Professional” should be your first choice.